The system consist of Vertex Server software, unlimited Vertex Client and Vertex Media Importer licenses. Query and build, automated DICOM, and system backup profiles are provided by default. Also included is a pre-configured PC with monitor, keyboard and mouse. DISC label design software and all necessary cabling are also provided. 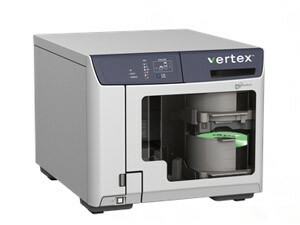 Vertex is the industry’s most advanced software for sharing, burning, importing, converting, viewing, and storing medical studies, images, and related documents. Vertex enables radiology, cardiology, oncology, endoscopy, surgery, and dermatology professionals to easily share and manage medical studies using a simple, streamlined process. Vertex combines the best features of disparate medical imaging applications into a single, IT-friendly software with an intuitive interface.